GoPro started a trend when it launched the Hero4 line with 4K video recording. Today, it is pretty much impossible to find a new action camera that does not advertise this feature -- even when, in reality, most are not actually capable of it. The Hawkeye Firefly 8S is different. It is the first action camera that I have tested that offers true 4K video recording. It is also among the most affordable options on the market, which, on paper, makes it great value for money. But how good is it in the real world? I've tested it to find out. 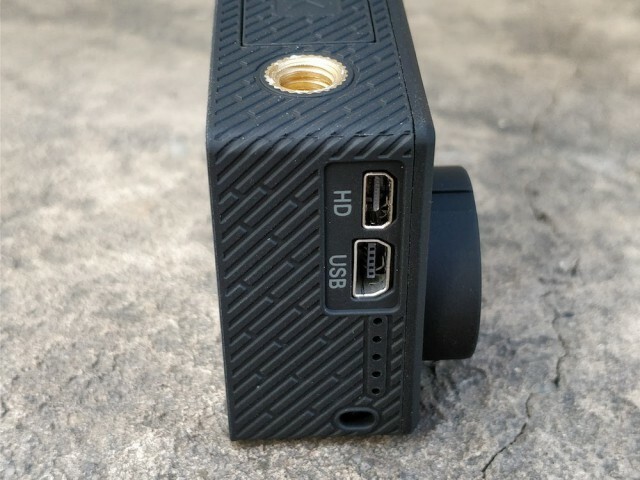 The Firefly 8S comes with the usual accessories for a budget action camera, meaning there are a lot of them in the box. There is a waterproof case, zip ties, adhesive tape, various mounts, joints, a carrying strap, and a bunch of other bits and bobs. Of course, you also get a battery and mini-USB cable in the box. There is nothing that stands out here, save for the carrying strap (one of the two cutouts, on the lower right corner, are shown in the photo above), but Hawkeye does provide everything that you need to mount it where you need to and start using it right away. The Firefly 8S has an Ambarella A12S75 chipset, which is one of the few on the market that allows for native 4K video recording. It tops out at 24FPS when in 4K mode on the latest firmware. The chipset is paired with a 12MP Sony IMX117 sensor. There is also a wider SView mode, which also records at 24FPS, so you can fit more in the frame and get a field of view closer to that of a GoPro in SuperView. Hawkeye does not accurately advertise all the resolutions on the box, and neither do the vendors which offer it. In the specs, you may find that it can do 4K video recording at 30FPS and 1080p at 120FPS, when, in reality, the limit is a bit lower. When it comes to photos, the Firefly 8S does what it says on the box, namely 16MP images. However, since the sensor is only capable of 12MP, it will upscale from a lower resolution. 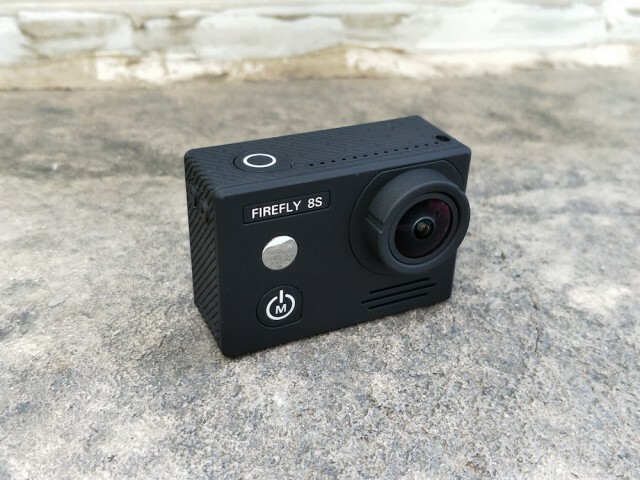 If you have used other action cameras before, you will get used to the Firefly 8S right away. It has a pretty standard design, with the power and mode button on the front, recording and select button at the top, two navigation buttons on the side and another navigation button on the back. The two buttons on the side are used to go up and down through the menu, and one of them also doubles as a Wi-Fi button. The button at the back is used to switch between menu tabs. On the bottom you will find the battery, which is behind a sliding door. The microSD card slot is at the back, to the right of the display and above the navigation button. Speaking of the battery, the Firefly 8S has amazing battery life. Based on the timestamp in the videos, you can expect to record between one and a half and two hours of video before the battery dies. That is way more than I have experienced with action cameras I tested previously, which is impressive considering that the Firefly 8S has been mainly used in 4K mode. Hawkeye says that the Firefly 8S also supports a Bluetooth remote control (one is not provided in the box) and an external microphone, both of which can be pretty useful. The remote control can be had for less than $6 and the same goes for the Hawkeye-branded external microphone. The Firefly 8S is not without fault though. 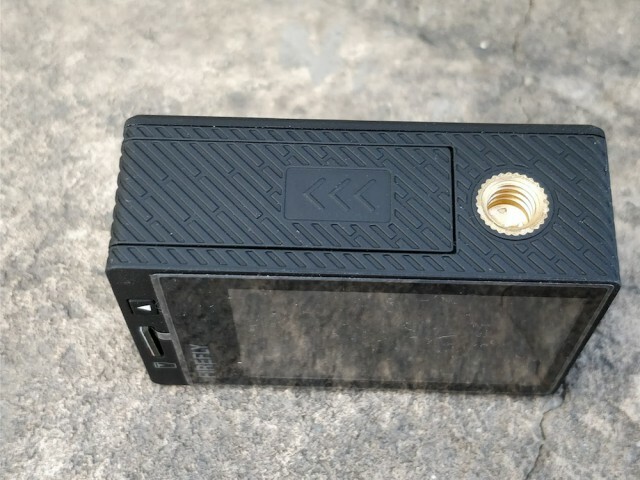 For some reason, Hawkeye only lets you press one of the three navigation buttons on the side when the action camera is in the waterproof case, more specifically one on the side. So, if you want to change some settings that are in a menu tab, you need to take the Firefly 8S out of the waterproof case. Something else that I find quirky is that when you are recording, the LED behind the power button turns off, but the Firefly 8S logo remains backlit. I expected the power button to flash in that scenario, but, in the end, the result is the same. When the Firefly 8S is in standby, the LED behind the power button stays on though. Same goes for charging. Also on the software side, the Firefly 8S lacks an option to rotate the video in camera. This means that, if you record with it upside down, you will have to rotate the video in post-processing. It is an unusual omission, as most action cameras come with such functionality. I have tested the Firefly 8S in 4K at 24FPS and 1080p at 100FPS. At the highest resolution, the video quality is, quite frankly, unbelievably good. And the difference between the two modes is like night and day. You can tell right away when you are looking at a 4K video, because everything is so well detailed. The Firefly 8S records in 4K using a bitrate of 60Mbps, which means that a video that's nearly nine minutes long takes about 4GB of space on the microSD card. What makes choosing the 4K option a no-brainer that you are not going to save any space by going with, say, 1080p at 100FPS. In this mode, videos will actually take more space, as the bitrate in this case is 72Mbps. So, a 4GB file only houses a video that's less than eight minutes long. But, most importantly, the quality is nowhere near that 4K level. Quite frankly, after watching those 4K videos, I do not want to go back. The downside to 4K, like with other high-bitrate modes, is that you need a huge microSD card to record a couple of hours of video and an even bigger hard drive for long-term storage. On a 64GB card you can expect to fit about two hours of video. Still, that's a small price to pay, all things considered. The videos that have been uploaded to YouTube are straight from the camera. No post-processing has been done. As you are looking at the samples below, keep in mind that YouTube applies some compression algorithms, which do affect video quality to some extent. Hawkeye is one of the few companies in this market that provides regular firmware updates for its action cameras. The Firefly 8S launched in June and, since then, it has received a dozen firmware updates. Yes, that's right. Hawkeye introduced 12 firmware updates in less than four months. This level of support is uncommon in the action camera market, but it does tell you that you can count on the company to fix bugs and improve the software down the road. The Hawkeye Firefly 8S is an impressive action camera that delivers fantastic video quality in 4K at a very attractive price. In its segment, there is probably nothing that comes close. It is currently available for $102.99 on GearBest.